As usual, all of the new sprites, portraits and logos are available to use in the GFX Generators. I’ve also added two things I didn’t have time to do during the updates. 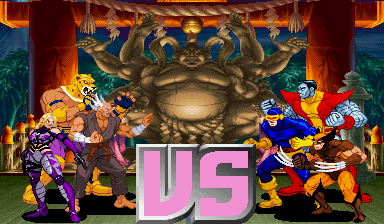 First, the game-specific generators (Darkstalkers 3, X-Men:CotA, Marvel Super Heroes and River City Ransom) have been replaced with new pages, including a new Street Fighter Alpha 3 generator, using only the characters who have SFA3 vs. portraits. I also added a new Comic 88×136 tribute type in the “fighter scale” generator: a long-overdue Street Fighter x G.I.JOE TPB logo. 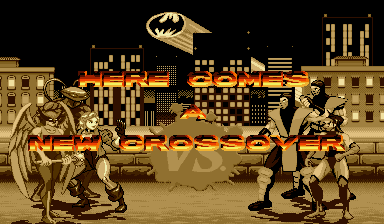 … Crossup Beatdown! I’ll be using that name for some videos I plan to make, like this teaser I put up on YouTube. Thanks for stopping by and I hope you enjoyed these updates! What started as a Marvel vs. Capcom-themed update turned into a free-for-all crossover, causing me to add more updates with Tekken on Wednesday and SNK on Thursday. 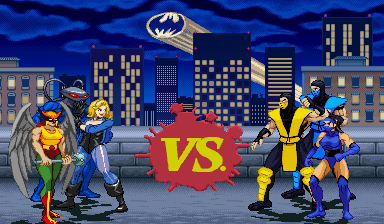 It ends tonight with Mortal Kombat and DC Comics facing off again! Ha! Saw you comin’ this time! It’s the last night for this theme, so just step on out now. All newness has been added to the main GFX Generator, where you can make your own fake screenshots, too! Unfortunately, I can’t fit all of these names into the post title. Seeing as how this won’t be the last time this crap happens, it’s going to need a name. Crossup Beatdown. That’ll work. From this day forward, any time this sort of crossover madness happens on this site (and it will), that’s the name I’ll use. This edition of Crossup Beatdown is over, but beware, because you never know when it’ll happen again. However, if you checked out every update as they happened, your multi-universal senses may have sharped a bit, as have mine. We’re one with many cosmoses now, and that’s a pretty cool deal if you think about it. Thanks for stopping by and don’t forget that there’s a new X-Men print in the shop! Well. 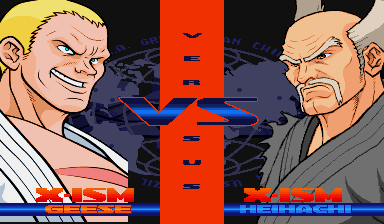 I decided to make a Marvel vs. Capcom update for Tuesday, which went well until Tekken’s Heihachi Mishima decided to show up. So Wednesday’s update saw Tekken added to the crossover, with the X-Men fighting them off (and adding a new print to the shop). 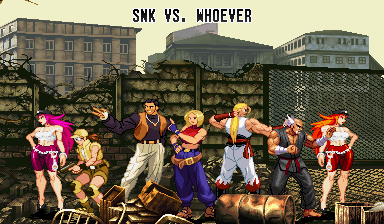 That was ruined by Gesse Howard lurking in the shadows at the end of that news post, and the only way to save it is to finally put some new (and long-overdue) SNK-related content on the site. – Tekken: Heihachi gets a KoF-style sprite. 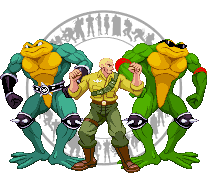 Believe it or not, it’s the first KoF-style sprite I’ve ever made from scratch, and I don’t think it’ll be the last. All of these things have been added to the main GFX Generator, where they can be used to make fake screenshots like the ones at the top of this news post. See? That’s what I thought. Well, what game or company is it this time? 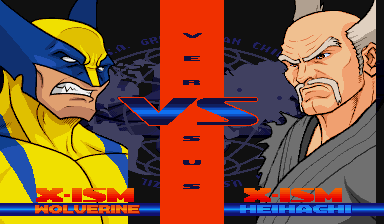 There was a Marvel vs. Capcom-themed update yesterday, but Heihachi crashed it at the end, forcing me to do this update with more sprites and some new portraits! all new items were added to the main GFX Generator! 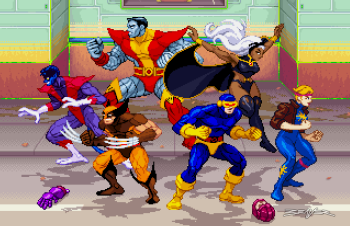 By the way, those all-new (but only Colossus is giant-sized) X-Men sprites come from a print that makes its debut today! This print is guaranteed to increase the mutant population of your wall, but not to ward off masters of magnet. You’ve gotta do that on your own! It’s available now from the ScrollBoss shop page! So… another update? Okay. 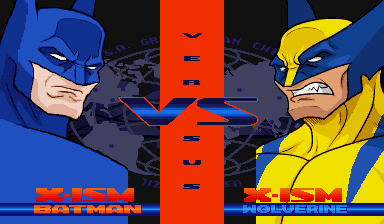 Come back tomorrow if you want to see how ridiculous this crossover gets! 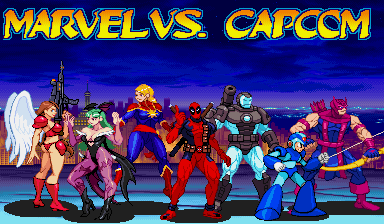 Marvel vs. Capcom: Infinite hits consoles and computers today, so I figured I’d pay tribute to the whole series, seeing as how the original game is one of the main things to get me into spriting fighting-scale sprites. This update features remakes of characters from the entire series! All new sprites and logos have been added to the main GFX Generator! … looks like there’s going to be an update tomorrow, too. But is that THAT the only interloper we’re going to see tomorrow?